Collecting antique vases is a hobby enjoyed by many people. Gardeners may love to collect bud vases, while those who adore Depression glass may collect colorful vases available in their favorite patterns. It might start small. Maybe you happen to pick up a pink Depression glass bud vase at a garage sale or you happen to find a head vase in your attic. All of a sudden you begin to find other vases you love and soon you have created a colleciton. There are many types of vases to collect. Some people collect certain patterns while others choose certain manufacturers or motifs. You may want to have an eclectic mix or all Vaseline glass. Collect what you love, there is no right or wrong way to collect vases. Lady head vases can be relatively inexpensive antique vases for collectors, however some very desirable vases can be priced in the thousands of dollars. They can be found in many antique stores and they come in many different sizes. Your mother or grandmother may have had one displayed on a shelf in her home, as they were very popular during the 1940's through the early 1960's. The lady head vases are also still being made, so if you are serious about collecting antique vases, read up on this hobby using lady head vase collector price guides available at most retail book stores. You can find head vases at the following online stores. No Limit is a shop in the Ruby Lane Antique cyber mall. They carry a variety of head vases and other unique items. PayPal, money orders, or checks are the preferred ways of payment. Depression glass vases are relatively easy to find and come in all the beautiful colors and patterns of any other Depression glass. Other types of glass from the 1900s is also highly collectible. You can find antique glass vases in the following online stores. Just Glass is an online antique mall for vintage glass. The large variety of shops represented carry everything from crackle glass to crystal. Catisfaction Glass Gallery specializes in Depression Glass, Early American Pressed Glass, and Art Glass. Aardvark Antiques carries a variety of estate items and has a large number of antique glass vases. If your tastes run on the expensive side, there are always beautiful Oriental vases, including those from the Ming, Qing and Song Dynasties. Other collectible Asian porcelain vases from the early 1900s is as collectible but much less expensive. If you prefer doing your research online, consult Gotheberg.com, it is the definitive antique Chinese porcelain collector site run by Jan-Erik Nilsson. Shops online that carry antique oriental include the following stores. J. Collector carries a variety of Asian antiques available for sale. They have an interest free layaway plan that allows the customer to pay for an item in three or four installments. American potteries like McCoy,Rosenthall, Roseville, and Weller. Antique vases can be displayed on sturdy shelves, tables, and behind glass front cabinets. When choosing how to display your collection consider both your lifestyle and the value of the vases you have. If you have small children or grandchildren in your home you may want to keep your display out of harm's way. Choose an area that does not get direct sunlight or direct heating or cooling. Sunlight can fade paint and cause it to chip off while sudden changes in temperature can cause cracking. Cleaning should be done with a soft cloth; use a mild soapy water for stubborn dirt. 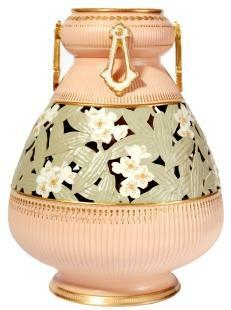 A collection antique vases will add beauty to your home whether you choose a particular type or an eclectic mix.